If there is a bathing suit that flatters all body types and ages, it's definitely the one-piece swimsuit, the top must-have fashion trend for summer. There are plenty of styles and designs to pick, but this summer the major pattern is the graphic print, usually a fun and cheeky phrase. It's a fresh and playful trend just perfect for the beach, the pool and even the street with a maxi skirt or a pair of shorts and espadrilles. What about you, did you already get your one-piece swimsuit? Hi Lilli, I like the one piece too. These are so nice. I can't wait to go swimming this summer. No Lilli a me stanno male anche se li adoro, ma io sono un tronco di legno!!!!!! This is such a classic swimsuit silhouette and the graphics really add such a fun touch. I love the last one especially! I just got a gold polka one piece :) Happy Monday Lilli! Ma che belli, sono il trend dell'estate! 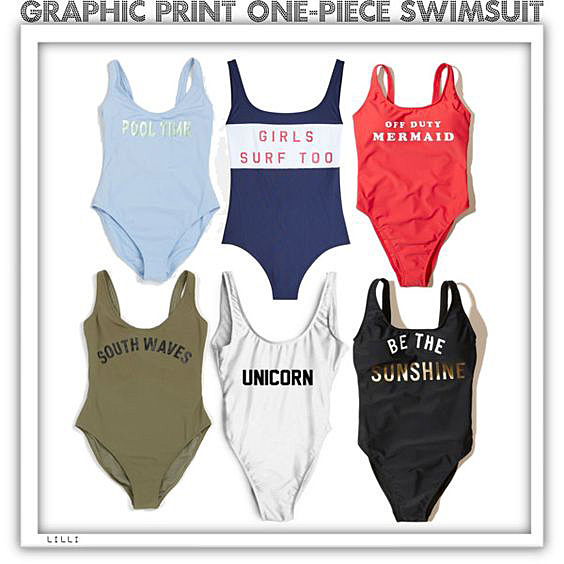 Since last year I'm in love with swimsuits, this trend looks funny I like the unicorn says. Kisses dear and happy week.